Robert Freitas wrote the multi-volume text Nanomedicine, the first book-length technical discussion of the potential medical applications of hypothetical molecular nanotechnology and medical nanorobotics. He was granted the first patent ever filed on diamond mechanosynthesis. Robert Freitas has a new 86 paper that describes how nanofactory molecular nanotechnology could be applied to removing carbon from the atmosphere. The new carbon capture technology proposed would be built by molecular manufacturing using first-generation nanofactories at a manufacturing cost of ~$1000/kg, would enable the atmospheric capture of CO2 at a total lifetime cost of about $21/tonne CO2, far less expensive than the $70-$200/tonne CO2 and higher estimated for conventional atmospheric carbon capture technologies. For an installation cost of $2.74 trillion/yr over 10 years followed by a maintenance cost of $0.91 trillion per year, a network of direct atmospheric CO2 capture plants could be emplaced that would be powerful enough to reduce global CO2 levels by ~50 ppm per decade, easily overwhelming current anthropogenic emission rates. This is sufficient to return Earth’s atmosphere to pre-industrial carbon dioxide levels near 300 ppm within 40 years from launch of program, and thereafter to maintain the atmosphere in this ideal condition indefinitely, eliminating one of the primary drivers of global climate change on our planet. Lower cost later generation nanofactories may allow the deployment of a global system of similar capacity for an annual installation and maintenance cost of $4.04 billion per year, capturing and permanently sequestering atmospheric CO2 using marine “carbon capture islands” at a total lifetime cost of about $0.08/tonne CO2. The cost is driven so extraordinarily low because the mature nanofactory, manufacturing atomically precise product for ~$1/kg, can also manufacture a cheap source of solar energy to power the CO2 capture and sequestration process. As usual, Robert Freitas is exhaustive in his analysis of any issue that he studies. He lists all of the startups looking to perform carbon capture and the studies of all known methods. A 2011 technology assessment panel under the auspices of the American Physical Society pessimistically concluded that the cost of atmospheric CO2 capture using all currently-known chemical-based approaches would likely approach $600/tonne in any actual fielded large-scale system. The potential value of using motorized micromachines to assist in CO2 capture has already been illustrated experimentally. 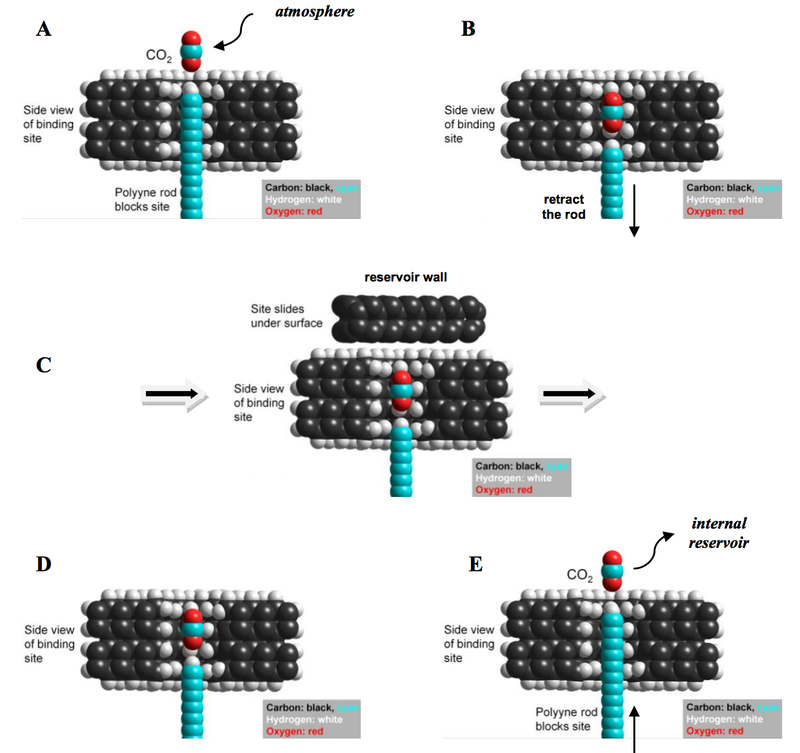 Here, we propose to achieve direct atmospheric carbon capture using a new technique based on atomically precise nanomachines called “molecular filters” that maximize the efficiency of molecular capture and transport across barrier membranes. Molecular filters can be fabricated in commercially useful quantities using molecular manufacturing methods such as nanofactories. A specific sequence, focusing on a single binding pocket, is illustrated above. Such molecular pumps generally operate in a four-phase sequence: (1) recognition (and binding) by the transporter of the target molecule from a variety of molecules presented to the pump in the source fluid; (2) translocation of the target molecule through a wall, into the interior of the transporter mechanism; (3) release of the molecule by the transporter mechanism; and (4) return of the transporter to its original condition, outside the wall, so that it is ready to accept another target molecule. Molecular transporters that rely on protein conformational changes are ubiquitous in biological systems.